Feb. 27, 2018 - Lincoln Dobson is in the search, rescue and recycling business. He searches for old growth forest timber used in building construction, rescues them from the demolition scrap heap, and recycles the douglas fir, western larch, spruce, and pine beams into new timber frame buildings, lumber products, and even heirloom-quality bed frames. By harvesting the industrial forest in this way, Lincoln’s Buena Vista, Sask.,-based business, Last Mountain Timber Wrighting and Recycling, helps to preserve existing old growth forests while providing some of the soundest, richly-textured, appearance grade wood available for new construction. Besides tree planting, Lincoln also spent years working for a timber framing company in British Columbia, where he acquired the mortise and tenon joinery skills needed to build hand-crafted timber frame structures. His inspiration for rescuing and recycling wood was ignited when his father, who was in the building demolition business, informed him that many old wooden grain elevators scattered throughout the rural countryside were being demolished. When he returned to Buena Vista, Lincoln’s desire to save forests along with his sawmilling and carpentry skills enabled him to launch Last Mountain Timber. Throughout the past 20 years, the company has rescued more than 1.6 million board feet of timber from demolished buildings. The old growth beams have typically been in structural building components anywhere from 40 to 110 years, with some beams measuring as large as 12” X 16” up to 24’ long. The company either salvages the timbers themselves or purchases them from elsewhere as they become available. Last Mountain Timber’s best industrial timber resource has been old wooden grain elevators slated for demolition. For many years, the business was extremely busy rescuing high quality, old growth wood commonly used in these structures. To this point, the company has salvaged timber from 205 grain elevators, but Dobson says that similar to old growth forests, it is becoming harder and harder to find industrial timbers from demolition projects, as many grain storage silos have transitioned to cement construction. This year, there were only three elevator demolition projects and that will likely be the last of them. In the meantime, the company’s customers keep a keen eye for demolition projects where beams could be rescued and let Lincoln know when they become available. While harvesting the industrial forest is an important part of Dobson’s business, what happens to the old growth timber after they are rescued is how the company makes a profit. The timbers are sometimes used in new timber frame construction, but more often, the surfaces on the square beams are carefully sawn to remove the grey exterior appearance acquired over time to reveal their natural inner beauty. The timbers are then custom-sawn into a variety of wood dimensions to meet customer requirements. Recently, they installed a 12” X 14” timber measuring 20’ long and a couple of 12” X 14” posts at the entrance to the Jiffy Lube headquarters building in Edmonton, Alta. They have also supplied material for a Montana’s restaurant in Saskatoon, Sask. While they have done business throughout Canada and the United States, their sales and projects these days are a lot closer to home. The key component to the sawmilling side of their business is a Wood-Mizer LT40 band sawmill with a 12’ bed extension. This allows the company to custom saw timbers up to 33’ long. While there was no question that Lincoln was going to purchase a Wood-Mizer sawmill because of his past positive experience using the equipment, he says it was important to properly power the unit to deal with harder wood material like recycled douglas fir. Recently, Lincoln upgraded to using Wood-Mizer RazorTip carbide tipped blades for remanufacturing purposes on abrasive timber. The material produced on the band sawmill has numerous uses in homes, cabins, lodges, commercial structures, home additions, garages, barns, gazebos and covered residential decks. “When we put a timber on there, it could be for a set of stairs, a table, a bed or a bar top,” Lincoln says, depending on the cut list to fill orders. The company also manufactures truss and roof systems, residential and commercial flooring, mouldings, baseboards, and casings. 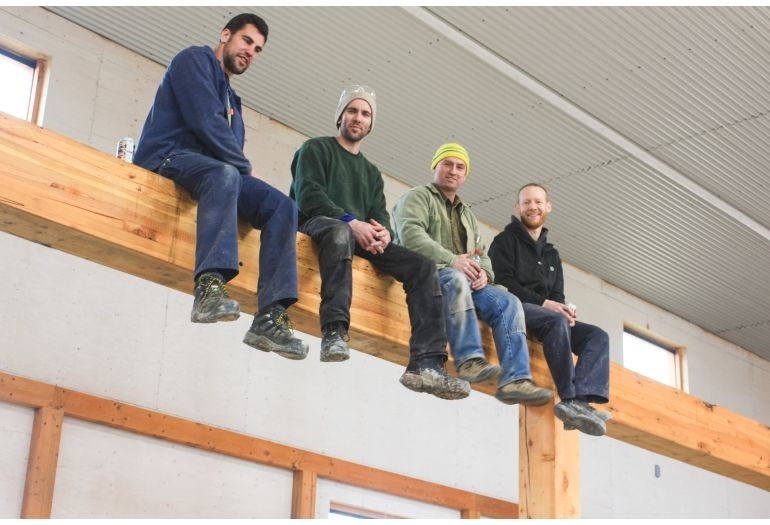 The material from the band sawmill could also be components for the supply and construction of engineered and handcrafted mortise and tenon timber frame buildings that Last Mountain Timber offers as part of its diverse product line. To complement his Wood-Mizer sawmill, Lincoln uses a Wood-Mizer EG200 twin blade board edger primarily to conserve and edge grey jacket boards generated from the first cut on the bandsaw mill. These boards are aesthetically pleasing material for feature walls or as headboards on bed frames. Most recently, Lincoln purchased a Wood-Mizer BMS250 blade sharpener and BMT150 tooth setter. “It’s working really well because the system is able to do a better job than the two guys I was sending my blades to for sharpening,” Lincoln says. He says that he likes that Wood-Mizer offers many options to grow as needed with all their equipment. With industrial old growth forest timber becoming harder to find, Last Mountain Timber has made the transition to also marketing green and first-cut wood, which includes processing raw logs, sawing other wood species like birch, and salvaging local downed trees that might have ended up in the landfill or burned as firewood. Lincoln concludes that he depends on and uses his Wood-Mizer equipment every day and his business wouldn’t be where it is today without it.